Debate: "The Politics of Immigration in the Age of Trump: How Should Catholic Social Thought Inform America’s Immigration Policy?" Complimentary lunch will be served at noon, talk will begin at 12:30 pm. The Oak Room is located on the second floor of South Dining Hall. R. R. Reno is editor of First Things magazine. He was formerly a professor of theology and ethics at Creighton University. He is the author of several books including Fighting the Noonday Devil, a theological commentary on the Book of Genesis in the Brazos Theological Commentary on the Bible series. His work ranges widely in systematic and moral theology, as well as in controverted questions of biblical interpretation. Peter J. Casarella is Associate Professor of Theology at the University of Notre Dame. He has published almost fifty essays in scholarly journals on a variety of topics—e.g., medieval Christian Neoplatonism, contemporary theological aesthetics, and the Hispanic/Latino presence in the U.S. Catholic Church. In 2005 he served as President of the Academy of Catholic Hispanic Theologians in the US (ACHTUS). 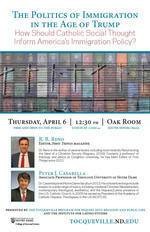 Co-sponsored by the Institute for Latino Studies.